Dubai, UAE - 5 March 2019: His Excellency Engineer Saif Al Shara, Assistant Undersecretary for the Sustainable Communities Sector at the Ministry of Climate Change and Environment (MOCCAE), has officially inaugurated AgraME today (5 March), one of the region’s key agribusiness, aquaculture and animal health trade events taking place until 7 March at the Dubai World Trade Centre. Mohammed Bin Obaid Al Mazrooei – President of the Arab Authority for Agricultural Investment and Development (AAAID). His Excellency Eng Al Shara said: “The problem of food insecurity continues to plague the world. Following the decline in the number of starving people in the world over the past decade, this number has, for the third year in a row now, risen again reaching more than 820 million in 2017, according to the FAO Food Security and Nutrition Situation Report 2018. He added: “Despite of the gloomy picture, there are reasons to be optimistic. The increasing adoption of modern, smart technologies in the field of agriculture - which are the highlight of this exhibition – will play a key role in the industry’s future. His Excellency Eng Al Shara pointed out that the UAE has maintained a good level of food security, ranking 33rd in the Global Food Security Index 2017. 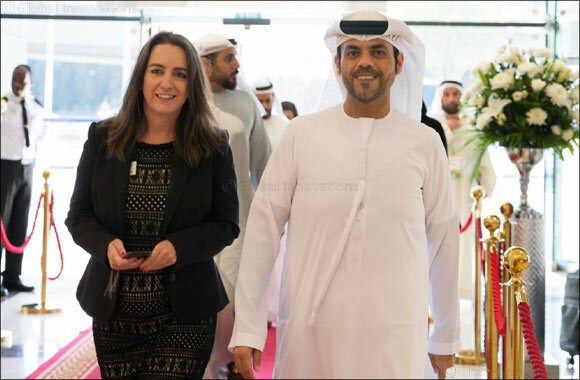 He said: “The high food security level is a result of the UAE leadership’s commitment to diversifying food sources by establishing strong business networks and trade relations with important exporters of staple foods, and the promotion of private investment in the agricultural sector, at home and globally. Over the next three days, AgraME will offer visitors free access to four different conference streams – the Agriculture Investment Forum; Controlled Environment Agriculture; Aquaculture, and Animal Health. The conference streams for 2019 have taken shape around the UN Sustainable Development Goals (UNSDG) - a blueprint to achieve a better and more sustainable future for all. AgraME is also bringing together a number of industry leading companies from over 40 countries, such as Al Dahra Holdings, Jain Irrigation, Agthia and Al Rawabi who will all be showcasing the very latest technologies and innovations in the market. “We have once again received huge support from both local and overseas businesses, government bodies and associations this year which has allowed us to keep delivering an event that highlights products, content and innovation” said Samantha Bleasby, Exhibition Director for AgraME. Under the patronage of the UAE Ministry of Climate Change and Environment, AgraME will take place from the 5 – 7 March 2019 at the Dubai World Trade Centre. With a targeted focus on the Crop Farming, Animal Farming, Aquaculture, and Animal Health sectors, AgraME 2019 will attract suppliers and buyers, both locally and internationally, looking to source the latest products and innovative solutions in order to create a sustainable food supply across the MENA region.